We spend countless hours creating your original, one-of a kind wedding video, because afterall. . . your love story is one of a kind all on it’s own. 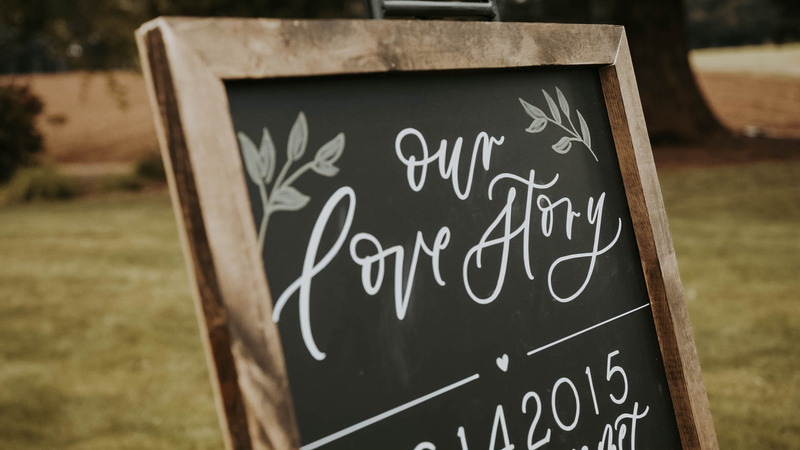 We find new and creative ways to showcase your unique love story and re-tell your special day in a cinematic format. Our mission is to capture all the wonderful details you put into your wedding so you can re-live those precious moments forever. Our team is made up of a husband + wife team along with other awesome hopeless romantics that can’t wait to be apart of your big day. Is Hiring a Videographer A Must or a Maybe? Here’s my opinion on why videography is important and why I do what I do. You can read more via The Wedding Collective. “Wedding videography is so so important and often overlooked by brides. I’ve been there, I’ve been a bride and number crunching is no fun. Trying to make sure everything is like you’ve envisioned your whole life and “Pinterest-worthy” doesn’t always come cheap, but what’s so important is remembering to invest in the people who are capturing all the work you put into your day. Not only that, but capturing your friends, your family, and your spouse at that point in your life. All the smiles, the tears, the laughter, the hugs. All those precious, important memories deserve to be captured in the most real way possible, and that’s what videography does. I decided to get into wedding videography right out of high school, and to be perfectly honest. . . wedding videography sort of found me. My husband owns a video marketing company here in Grants Pass. It was there I learned film and editing. Once his company started to get inquiries for weddings, he realized how much I loved and enjoyed that market and passed that baton to me, and thus Forever Films was born. 5 stars 100%, all the way. I debated for months and months (and months) about hiring a videographer for our wedding and when I contacted Kaitlyn, there was not a doubt in my mind that this HAD TO HAPPEN, and her and her hubby were the ONES. I had seen a previous video of theirs, and knew immediately I wanted the same thing. Something that I can look back on and truly feel in the moment again. She (and Seth!!) delivered that and more. She listened to EVERY request and captured every moment perfectly. You hardly noticed they were even there, even if by the end we wanted them to be a PART of it, and join in on the celebration! I would recommend this duo to any and every couple. I cannot describe enough how grateful we are to have had them there with us to document our day. The price is fantastic, their work is incredible. If a picture can paint a thousand words, then Forever Films writes a masterpiece. This is fine art that is created here. When you find yourself in tears after a teaser sneak peek of the real deal, you know you’ve been in the presence of a true artist! Thank you for giving us this precious treasure to have and to hold forever and always! Kaitlyn at Forever Films is friendly, professional, and passionate. The video she made captured our wedding perfectly. She did such a wonderful job at capturing every important moment. Kaitlyn is a master of her craft and is the absolute best choice for a wedding videographer. Forever Films was absolutely amazing! The wedding video they made for my daughter’s wedding was perfect in every way! She and her husband can relive their special day because Forever films captured it so beautifully! Forever Films did the videography for our wedding!!! And they were amazing and very professional:) I wasn’t sure if I wanted to spend more money on a videographer but I’m so happy that I did!!! The wedding goes bye so fast that day and it’s so nice to have something that you can watch to remind you of that day and everyone that was there!! I watch it at least a few times a month:):) the video was so beautifully done, I wouldn’t have wanted it any other way !!! If your on the fence about have a videographer? I can tell you, you won’t regret having Kaitlyn do your wedding !!!! Absolutely love these people! The videos they put together are absolutely phenominal and I just love how much kindess, love and effort they put into their videos! I seriously cannot believe how beautiful and elegant our wedding video turned out. Kaitlyn and Seth are wonderful people, I couldn’t have asked for a better videography team! And to think we almost decided not to have a video. I am so pleased with the work they did, they even gave us a little engraved box with our names on it along with stills and our video. All hand delivered!! The video Forever Films put together for us surpassed our expectations. They were able to capture a natural flow and beauty of our crazy wedding day! We will forever use Forever Films of our filming needs! Literally everything they did turned out better than we could’ve hoped for! Kaitlyn and Seth did my sister’s wedding and then my fiancees cousin’s wedding this summer. At my sister’s wedding we met Kaitlyn when we were getting ready in the bridal room and she was SO sweet and blended in so well with the girls. They did amazing at capturing how each wedding felt in their own way, and each video is absolutely stunning. You literally cannot go wrong with Forever Films! Seth and Kaitlyn were such troopers on our wedding day! From the getting ready to trekking through the forest to dancing on the beach! It was great having them capture our day! The video is beautiful and I look forward to reliving our day and sharing it with those that couldn’t be there! Thank you Forever Films! I cannot stop watching our wedding video. Kaitlyn and Seth exceeded all of our expectations! On your wedding day, you are so nervous, stressed and making sure everything goes as planned. At the end of the day, you look at your new spouse and ask, “Did that just happen? That was so fast!” You don’t get a chance to enjoy your day, or really embrace the moment you said “I do” to the love of your life.. Having Kaitlyn and her team there to film my special day was amazing to have after the hustle and bustle of everything. It makes you relive, experience and remember your day for the rest of your life.